I couldn’t decide what my very first blog post of the year should be, and eventually gave up. Why do I always overthink everything? It may be the new year, but today it’s business as usual at Glamorable HQ, and I decided to kick off Q1 with a foundation review! I received bareMinerals barePRO Performance Wear Liquid Foundation ($34 for 1 oz) several weeks ago, and wasn’t able to give it a proper test due to the holiday madness. I finally had a few days to actually wear it, and I feel like I’m ready to share my thoughts. 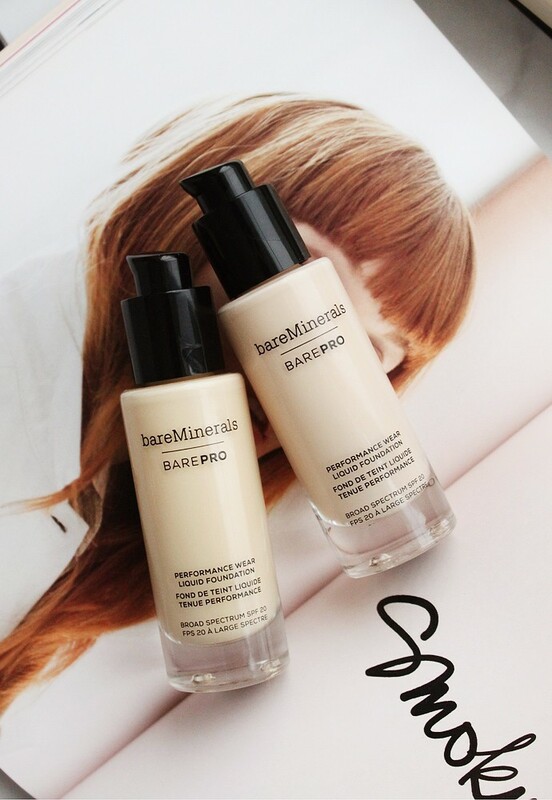 barePro Performance Wear Liquid Foundation is one of the newest in bareMinerals lineup. Its heat-resistant, water-resistant, and sweat-resistant formula provides full coverage with a natural matte finish. The foundation is infused with bamboo stem cell extract and papaya enzymes to improve the skin tone and texture over time. At the time of this review, it’s available in 30 carefully calibrated shades that look like real skin. The foundation also offers mild SPF20 PA++ to help protect from premature skin aging caused by sun exposure. While I personally think SPF20 is inadequate for everyday wear, it’s still better than nothing at all. 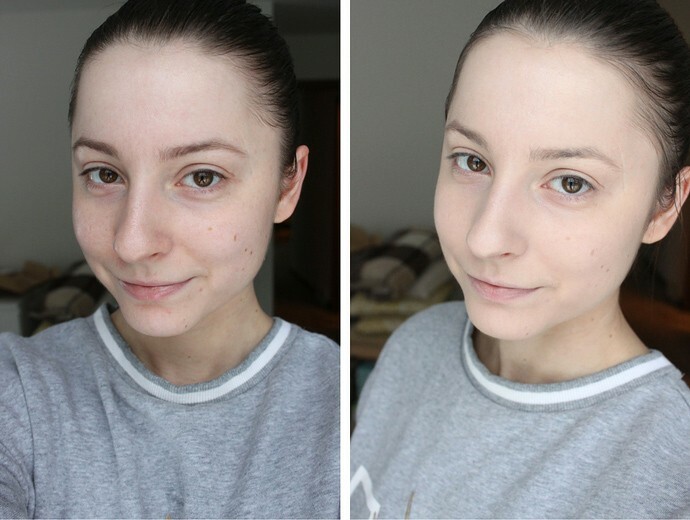 Because this is a matte foundation, I prefer wearing it with a hydrating primer underneath. It won’t ruin the matte finish, but it prevents the dry patches from peeking through. My skin gets easily dehydrated during the cold months, so a layer of moisture is a must or my face will look flaky. Speaking of matte finish, as bareMinerals described it, it’s definitely natural matte and not ultra matte. It looks like lightly powdered skin rather than a stick of chalk, if that makes sense. I know ultra matte everything is trendy right now, but I much prefer the more natural finish I get from this foundation. 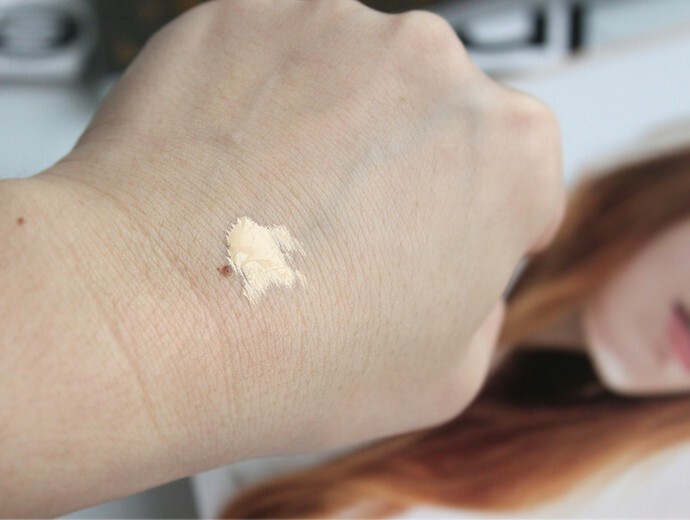 Coverage test: blended. Notice that the beauty mark on my hand is still keeping through, but all of the redness has been neutralized. Swatches: 01 Fair on the left and 03 Champagne on the right. Another thing I like about this foundation is how thin it is. No more caking on a thick layer to get the desired effect – one pump was enough for my entire face and even a little bit of the neck. You will need a dampened beautyblender or a brush to apply. I usually get medium-full coverage with a sponge and full coverage with a brush, but it all really depends on your technique. I did not have good results using just my fingers alone because the foundation sets too quickly. After a minute I was not able to spread it any further, so the coverage looked a little spotty. I got pretty bad results with a silicone blender too, but that’s probably because I’m just not that great at using them in general. Whenever I apply foundation with sili-sponges, my pores always look accentuated, and that’s the opposite of what I want. The pump dispenses the perfect amount of product for a single application. Glass bottles are thick and sturdy. 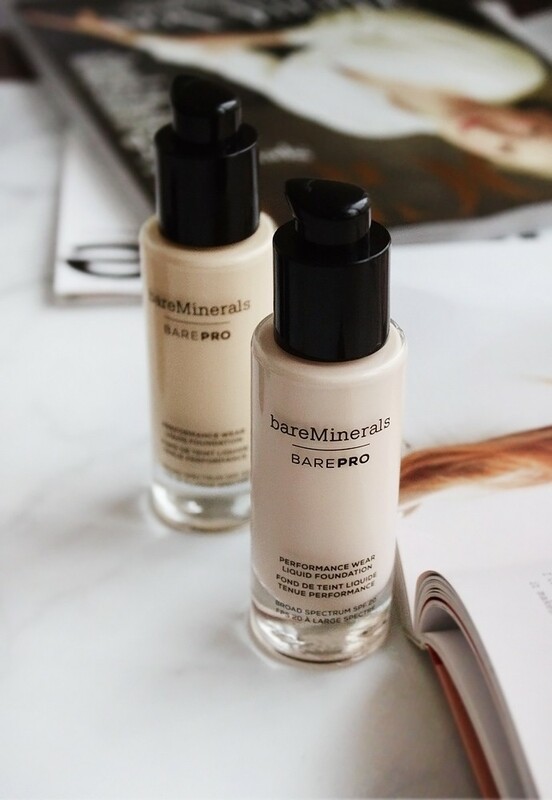 Although barePro Performance Wear Liquid Foundation is advertised to last on the skin for 24 hours, that wasn’t the case. To be fair, no foundation lasts that long on me, because my combo skin tends to mess with just about any formula. However, it did last longer than an average foundation, and I almost never needed to touch up. I feel like packaging is something most people don’t really care about when it comes to makeup reviews, but I just wanted to quickly point out that bareMinerals did not skimp on this one. The foundation comes in heavy glass bottle with a sturdy cap and a really nice pump that dispenses the perfect amount for a single application. 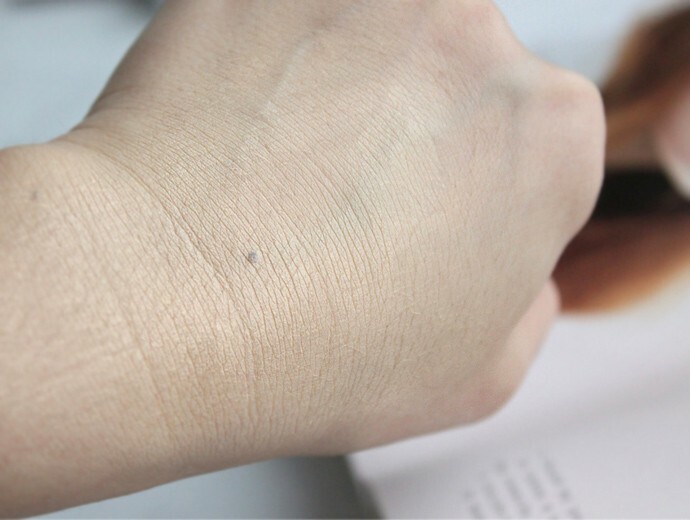 One last thing fellow oily & combo skin gals might be curious about – oxidation. 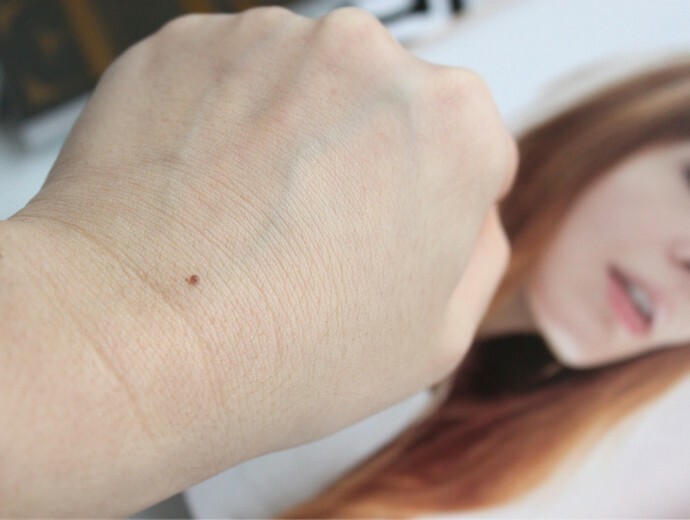 The foundation does oxidize slightly and becomes a teensy bit darker, but that change doesn’t really stick out. If anything, it kind of blends with my natural skin tone more and looks less like makeup and more like real skin. The difference in color is not noticeable under normal circumstances. You like full coverage foundations. You like matte finish, but hate ultra-matte. You often forget to apply SPF in the morning. You prefer luminous or ultra matte finish. You don’t like full coverage foundation. Ingredients: Water, Cyclopentasiloxane , Trimethylsiloxysilicate, Butylene Glycol, Silica, Peg-10 Dimethicone, Bis-Butyldimethicone Polyglyceryl-3, Bambusa Arundinacea Stem Extract, Sodium Glutamate, Disteardimonium Hectorite, Sorbitan Sesquiisostearate, Hydrogenated Lecithin, Methicone, Papain, Aluminum Hydroxide, Stearic Acid, 1,2-Hexanediol, Caprylyl Glycol, Carbomer, Algin, Tocopherol, Sodium Dehydroacetate, Phenoxyethanol. May Contain: Titanium Dioxide, Iron Oxides. 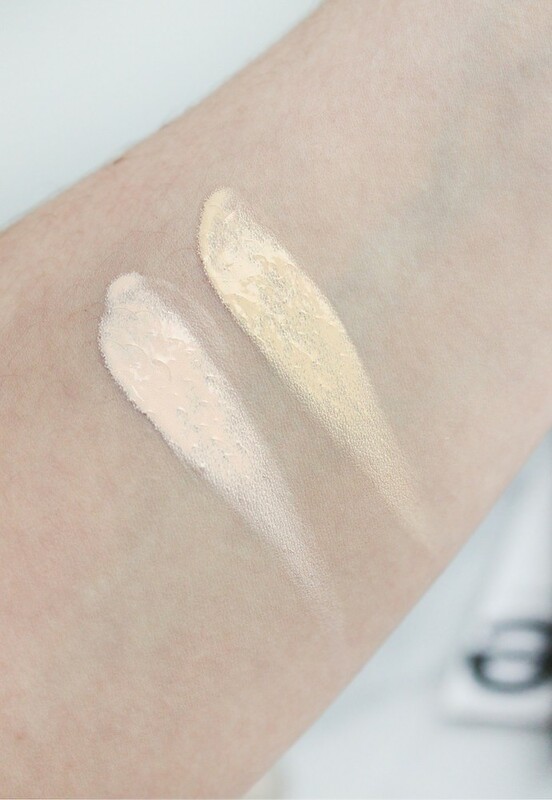 Full-face swatch: bare skin on the left, 01 Fair + 03 Champagne mixed on the right, no concealer. It’s a great match for my neck! 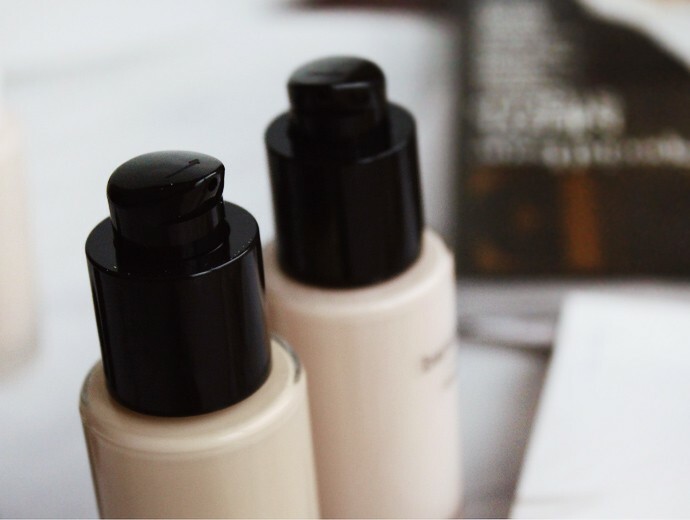 To sum up my experience, bareMinerals barePRO Performance Wear Liquid Foundation is one of my favorite full coverage foundation releases of 2017, probably even among my top 5. It’s unscented, lasts all day [although not the advertised 24 hours, more like 12-14], doesn’t seem to clog my pores or cause breakouts, self-setting so I don’t need to worry about touchups, and just looks like second skin. Have you tried bareMinerals makeup? Do you wear full coverage foundation? Let me know in the comments below!